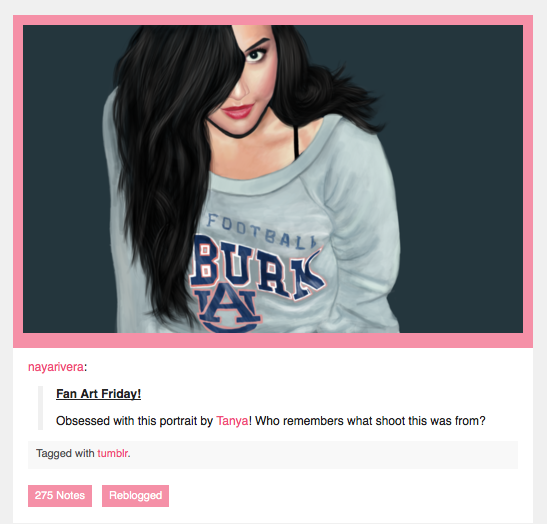 “Who remembers what shoot this was from?” Naya Rivera asked her Tumblr followers when posting this portrait of of her digitally, Deviantly drawn by superfan Tanya. Um, well let’s see… definitely us… and probably the 40,000 plus people who have made this post of the photos from that shoot (for FHM) the 7th most popular post on TWER in the four wonderful years we’ve been documenting celebrities in Auburn shirts, too. Naya says she’s obsessed with it. Because she Wore Eagle, obviously. Other celebrities in Auburn stuff: Rob Schneider, John Oates, Leonardo DiCaprio, Dr. Dre, John Travolta, Thierry Henry, Willie Nelson, Zac Efron, Naya Rivera, Molly Sims, Jason Segel, Joe DiMaggio. Related: ‘Art Changes Lives, and War Eagle’: AU’s Jule Collins Smith Museum of Art wins Andy Warhol photo of John Oates in Auburn shirt. That is awesome. Whoever did it have crazy talent. Mad cool is it that she is the 7th most popular.